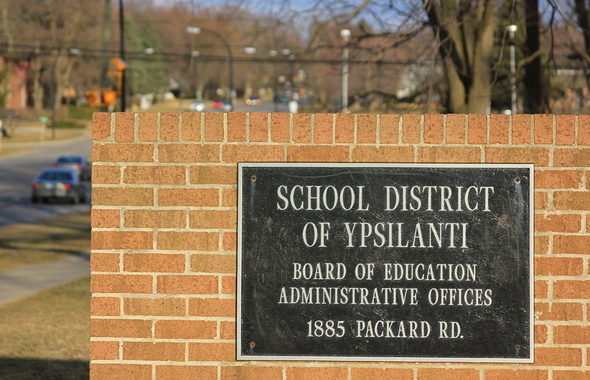 Posted on Tue, Mar 13, 2012 : 5:57 a.m.
Enrollment and budget projections for the 2012-2013 school year shows Ypsilanti Public Schools losing students and facing an increasing deficit. The current deficit of $9.4 million could become more than $14 million, according to Don Sovey, an accounting and finance consultant for the district. Sovey reminded trustees the figures are only projections and not an actual budget, which is still being compiled. He said it will be another four to six weeks before the 2012-2013 budget proposal can go before the board. The projection showed a possibility of revenue dropping to just below $40 million, about 12 percent lower than this year’s revenue. Sovey said part of the loss can be attributed to an expected decline in student enrollment and cuts in state and federal funding. According to enrollment projections presented by Sharon Irvine, executive director of human resources, the district is also expected to lose more students next year. The enrollment decline could result in the district losing anywhere from $375,000 to $2.8 million. The district receives $7,514 per pupil allowance from the state, which according to Sovey is almost $500 less per student than in 2010. Board President David Bates and Vice President Kira Berman expressed their discontent with the state and federal cuts. "We've definitely faced some difficult challenges," Bates said, "and in my humble opinion, it's within a state that is showing less and less care for public education." The enrollment projections are based on trends over the last few years within the district, but Irvine said it can be difficult because enrollment factors are always changing. Among those variables is the opening of new charter academies and changes in school education models, she said. YPS lost more than 100 students in the 2011-2012 school year. Irvine said the decline in student enrollment could, in part, be attributed to competition with area charter schools and students using the Schools of Choice option and attending school in a different district. Tue, Mar 13, 2012 : 7:35 p.m. It would be interesting to see if AAPS officials had comment to this situation. Their School of Choice option is certainly a contributor to the problem. Might there not be a solution whereby AAPS' gains don't come at YPS' pain? There is a tipping point coming - those who can afford the time/money to send kids elsewhere will do so. There are lots of good choices in private, parochial, charter, and alternative district schools. The sin is that the students who remain will be from families who lack the resources to make any other choice, and the result could look like a small-scale version of the Detroit system. How about merging the AAPS and YPS districts, closing some schools, integrating support services, saving a struggling system and saving taxpayer dollars to boot? Tue, Mar 13, 2012 : 1:17 p.m.
Braggslaw, your comment implies that parents who leave your kids in Ypsi Schools don't care. This is just not true. Tue, Mar 13, 2012 : 1:03 p.m. The Ypsi school district is an unmitigated disaster.... what did they expect? Of course caring parents are going to pull their kids out. Tue, Mar 13, 2012 : 12:24 p.m. If you're wondering where the students are going, check the charter schools. But don't worry, the funds will go away even more as student numbers continue to decline. Tue, Mar 13, 2012 : 2:44 p.m. Forever it really doesnt matter where they are going, its that until the district gets better some of us wont be sending our kids. This is my 8th year paying out of my pocket for my sons education, with 5 more to go. Dont you think I'd rather send my kid to public schools and buy that vette, or go on vacation. The districts failure is costing everyone, with the kids paying the highest price. Thank God for charter schools, and having a choice.